Photography is one of Glenn's passions. His first camera, at age 12 was a Kodak Instamatic, using 126 film, soon it was replaced by an Argus C3 35mm rangefinder (the brick). He built his first B&W darkroom in the garage at age 14. To survive high school Glenn decided to become one of the yearbook photographers; nobody messes with the yearbook photographers! That was a good strategy since he went to a pretty tough high school. The yearbook staff used primarily medium format. using old twin lens reflex cameras. The yearbook photographers developed and printed every roll themselves. His tools have covered the format gamut from that first Instamatic to a beautiful wooden Wista 4x5 field camera, both color and black and white, slides to prints. In 1992 he started experimenting with digital imaging often building his own equipment and writing his own software. Glenn enjoys the technology of photography: cameras, lenses, lighting, meters, printers, spectrophotometers as well as software, inks and papers. The gestalt of a well engineered camera is a work of art to behold and use. He shoots Leica, Nikon, Canon and Hasselblad, all are works of art in their own way. Another passion is the night sky and astrophotography. Glenn's art work and design is in private collections and major museums including the Museum of Modern Art in New York. He has worked on commercial projects in addition to selling fine art prints. 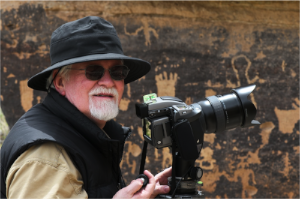 He has been lucky to study with some truly great photographers and printers over the years including Ansel Adams, Alain Briot, Fred Picker, Minor White and others. He continues to attend workshops and conferences as well as teach. His commercial projects have included teaching photography workshops for over 25 years, owning a successful industrial photography studio and a fine-art printmaking venture. His formal education in art included studying architecture and art at Cal Poly. Glenn is influenced by the crafts of painting and drawing, as well as the technology and science of imaging. Science enables art and art informs science! Glenn has enjoyed an unusual career in high technology serving in engineering and senior executive positions at Xerox, National Semiconductor, Apple Computer, GRiD Systems, NBI, WaveFrame, Interval Research, AT&T (president of AT&T Strategic Ventures), HP (chief technology strategy and later chief scientist) and Sun Microsystems (senior vice president and director of Sun Microsystems Laboratories). He currently serves as CEO of Range Networks, Inc.
Glenn is credited with the invention of the first laptop computer and is a pioneer in digital signal processing for audio and video. His company WaveFrame received a Technical Oscar. His GRiD laptop computer flew aboard all Space Shuttle missions from 1983 to 1999. He has served on the boards of directors for many public and private companies as well as non-profit organizations. He served as a board member of Georgia Tech's College of Computing (2004-2007) as well as board member and CFO (2001-2008) of Zero One: The Art and Technology Network and the biannual 01sj "Art on the Edge" festival. He has run a major urban symphony orchestra (1987-1991), consulted to Apple Records and major corporations on design, strategy, technology, innovation, M&A and venture investing.